Timothy & Diamond are best known for their stage performances: their mind reading act and their sword box illusion. Since Timothy and Diamond are full-time professional magicians they have created a great amount of magic acts with the times. In this video you will see: they also perform levitations, appearances, ventriloquism, costume changes, manipulations; they love to interact with both kids and adults on stage and perform with them in the name of good entertainment. Timothy and Diamond always treat their volunteers with maximum respect and due to their 20 years of stage experience the audience will always feel great. Hire them now! Book Timothy Trust & Diamond for your next corporate event! After an exhausting day of seminars and workshops the magic show of Timothy Trust & Diamond is perfect to bring everybody together again! The guests have a common experience of laughter and astonishment. Just sit back and enjoy the night! 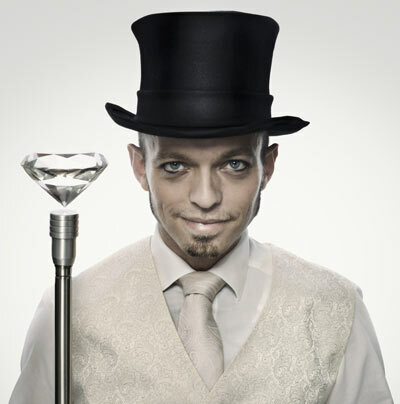 The magic show of Timothy Trust & Diamond is extremely flexible and can be performed anywhere: On a boat, in an airplane, in a castle or open air. Just ask us and we will give you the right direction! Again: Our 20 years of magic experience gives you a guarantee that your night will be loved, worshipped and remembered for a long time! Timothy Trust masters the art of ventriloquism into a modern and contemporary magic act. Timothy gives the illusion that the puppet is alive talking to him and the audience. Every Act is different. Timothy customizes the show to your event. His giant frog is a lady magnet who has advice and wisdom for all walks of life. The video is in german but there is no problem for Timothy to make a special english version for your next special event! Trust him on this! Timothy Trust & Diamond are natural born stage performers. But as they are full time professional magicians they also know how to master magic in close up situations. Watch Timothy perform his sleight of hand in the caribbean! You can find more close up magic on their youtube channel!